It’s not every night you get to see a Nobel Laureate rock the stage in the middle of the California desert. 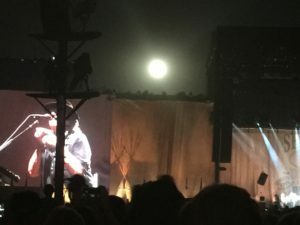 But I was lucky enough to be in the audience of 75,000 last week when Bob Dylan, who had just won the Nobel Prize for Literature, performed at Desert Trip II. Dylan, ever the iconoclast, didn’t make reference to his new award while he was on stage–in fact, he’s been so quiet about the whole thing that the Swedish Academy has “given up knockin’ on Dylan’s door” to find out whether he’ll attend the award ceremonies in Stockholm later this year. Young sang “Harvest Moon” just as a full moon rose over the stage. Paul McCartney, the Rolling Stones, The Who, and several other iconic bands and singers rounded out the three day festival in Indio, California. I was interested to learn that there was some nattering nabobing about the fact that Dylan, a song man, is being given the world’s highest prize in literature. I’m not even a huge music aficionado (I listened to Karen Carpenter and Neil Diamond when I was a young, not the “cool” bands, I admit), but I love the fact that Dylan won the award. What do you think of the fact that the Nobel Prize for Literature went to a song man this year, and to Dylan in particular? Was this a good call by the Swedish Academy? I went to a songwriting competition many years ago, as part of the BC Festival for the Arts, and really listened to the lyrics as the songs were being performed. Most of the writers (also performing artists) will never make a name for themselves–much like many talented writers–but the whole event was inspired and inspiring. The best lyrics are poetry that speaks to us. The fact that the poetry must conform to the rhythm of the music is an extra challenge that, say, free verse doesn’t have. I’m sorry to say I’m not a huge Dylan fan in the sense that I haven’t studied his lyrics, but perhaps those offended by the prize being awarded to a songwriter/performer might do well to remember that song lyrics are poetry. I, for one, am not offended that the prize went to a songwriter, even though some excellent novelists got left out, and even though I think that writing a great novel is more difficult than writing great songs. I’m tone deaf so anything related to the creation of music would truly be impossible for me, but I’m with you on not begrudging him the award. And I love how he’s pretending not to notice it! Writing poetry can be a highly productive exercise for the writer of fiction. Or attempting it anyway. The process forces an economy of words and a swift kick in one’s behind for it to come off true. How Dylan did this almost extemporaneously is a baffling wonder not only to us but to himself in his latter years. That his work got his highest accolade is a tribute to the muse in all of us who aspire, at least, to create word images that resonate with others. One of my favorite professors in college was a Poet Laureate, and he was tremendously inspiring in terms of encouraging creative thinking in his students. However, I failed miserably whenever I attempted to try my hand at poetry. I admire that art, but never quite “got” it, I think. Thanks for joining in today, Dan! Hadn’t heard that one, Mike! Love it! Songwriters winning the Nobel for literature? Well, in light of Dylan’s winning, I think next year they should give it to Jimmy Buffett, and then Little Richard the year after. I mean, why not. If the Nobel committee can’t be bothered to read an entire book, let’s bring in the songwriters! As Little Richard would say, “Wop-bop-a-loo-mop alop-bom-bom”! Isn’t that funny, the things people get polarized about? It’s classier than arguing about politics, though! When I was in college, I had a Dylan song book (because everyone had to play the guitar no matter how badly) and it was all about the lyrics for me. So yes, he’s a poet, and poetry is literature. And if you don’t like his singing (should you even call it that), what about the countless covers by those artists who *could* sing? I was tempted to point this award out to my parents who never had many nice things to say about the music I listened to in the 60s. But I’m too noble to do that. Ah, the “older generation,” gotta love them. Speaking of which, I wonder if the young people who idolized Dylan “back in the day” are happy that he won the Nobel, now that THEY’RE the “oldsters”. Thanks for joining in today, Terry! The very best lyrics and the very best poetry speak to us lyrically about the difficult, important things in life. How could they not be considered similar? I’ll be the first naysayer: IMHO, no. I completely disagree with the Nobel committee. I think it sets a bad precedent. I don’t dislike Dylan. I’m good with him as a singer-songwriter. But I don’t consider him in anyplace near the same league as Murakami, Rushdie, or DeLillo all of whom were rumored to be on the shortlist for the Nobel, each of whom I would have preferred to see over Dylan. I’m not sure how much any of the Nobel Prizes mean anymore, considering some of the people named winners. (No examples here…it would just lead to a political discussion). Dylan appeared at a Casino in a neighboring state, and according to coverage by a Dallas newspaper writer he didn’t say a word while on stage–just went from one song to the next. No comments, no introduction of his band, just sang and left the stage. So the Nobel Prize folks shouldn’t feel individual. He’s not talking to anyone. That’s a huge compliment. Here’s the song:https://www.youtube.com/watch?v=TLV4_xaYynY&list=RDTLV4_xaYynY#t=0. About 2:20 into the song you’ll hear one of the first uses of the Wa Wa pedel.